The verb fuse, derived from Latin, means to combine or blend by melting together. Along that line, fusion food refers to the combination of widely differing ethnic or regional ingredients or techniques. Examples include French-Thai fusion cuisine, Japanese fusion sushi* and a wide variety of pizzas: Thai chicken pizza and BBQ pizza, for example. We love all good fusion food, but can’t name too much in the fusion baking category. Perhaps granola cookies or Rice Krispies treats count. But we knew we’d hit the jackpot with this recipe created by one of our favorite baking blogs, Bella Baker, the opus of the gifted baker Lauryn Cohen. The recipe fuses sweet, fudgy brownies with crunchy, salty snacks—a terrific idea that just may become part of our annual Super Bowl party fare. *The California Roll, for example, is Japanese-California fusion. Avocados did not grow in Japan. 1. CENTER a rack in the oven and preheat the oven to 325°F. Generously butter a 9×13 glass baking pan. 2. PLACE the butter in a microwave safe bowl and top with the chopped chocolate. Microwave for 45 seconds, then remove and stir vigorously with a whisk until the ingredients are just melted. You don’t want it to get so hot that the butter separates. 3. MICROWAVE for another 30 seconds, if needed to melt the chocolate completely. 4. STIR in the sugar with a whisk. Whisk in the eggs one by one. Add the vanilla extract and whisk vigorously to bring the batter together and give it a shine before gently stirring in the salt and flour; stir only until incorporated. 5. SCRAPE the batter into the pan and smooth the top with the rubber spatula. 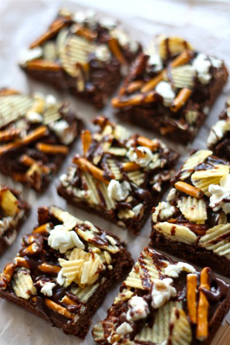 These memorable brownies may well become part of your yearly Super Bowl fare. Photo courtesy BellaBaker.com. 7. TRANSFER the pan to a rack and cool to room temperature. While the brownies are cooling, make the ganache. Put chopped chocolate in a medium bowl. Bring the heavy cream to a boil. Once the heavy cream has reached boiling, pour half of it over the chopped chocolate. Let sit for 30 seconds, then gently stir chocolate and cream together with a rubber spatula in a figure eight motion. 8. POUR the remaining heavy cream over chocolate and continue to gently stir. Add the butter, one piece at a time, until the ingredients are fully incorporated and the ganache is smooth and glossy. 9. POUR the ganache over the brownies; smooth with a rubber spatula to completely cover the top of the brownies. 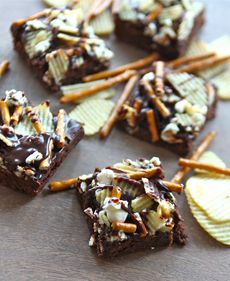 While ganache is still wet, sprinkle potato chips, pretzels and popcorn on top. 10. REFRIGERATE brownies for one hour until the ganache has set; then cut into squares. Find many more ideas on the Bella Baker blog. FIND MORE OF OUR FAVORITE BROWNIE RECIPES.